What does your morning usually look like? What routine do you follow on a day-to-day basis? What tasks do you complete in this routine? In what order do you complete the tasks? If you are like me, you have a morning routine. You likely never chose it; it is something that you developed and followed as the years went by. Don’t believe me? Look at it this way. What gets added to your list first? Socks or pants? Shirt or pants? Shirt or socks? Do you run around in your socks, shirt and pants or are you like most productive people in your socks, pants and trousers before you grab your shirt? Or do you do something else entirely? The order in which you get dressed in the morning is irrelevant. But what happens next is something that you should follow closely. Do you check your emails? Check your phone notifications? Answer text messages from colleagues and friends? Log on to Twitter or Facebook? Do you walk to the subway or the car, picking up a coffee on the way? When you get to work, do you chat with colleagues about irrelevant stuff? Do you open your email to deal with client issues and requests? Do you get caught up in the middle of office politics? Conversations about what happened in the news yesterday? Does any of this get you where you want to go? Are any of these things really that important to you and your goals? Are they truly important activities or are they just driven by habit? Working in fast-paced environments over the years, I have found that one of the startling differences between those who achieve more normal results and those who achieve phenomenal results is that the latter group focus on doing something that leads to their long-term goals and dreams first. They do it before opening their emails, dealing with minor gripes and getting distracted with office politics. Essentially, they learned to take a bite out of the big pie, the one that they really want to eat; the one that will give them the utmost people. They make sure that those first hours of the day are focused on the really important stuff. But all productive people do it early in the day and make sure that every day they take steps towards their vision of where they want to be – in work and in life. How you start your day really does matter. When you start with the minor stuff (e.g., chats with colleagues, dealing with office politics), you feel frazzled and swamped and you end up getting nowhere. When you begin with the big stuff (e.g., marketing projections, sales projections), you feel focused, productive and clear. 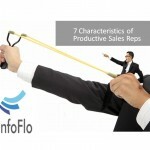 CRM tools like InfoFlo can assist you with getting organized and will help boost your productivity. As a result, you will improve your relationships and communication with customers, which in turn will increase your company’s profitability margins. With InfoFlo, you will be able to safely store all current and potential client information, including their contact details, social media profile information, relevant notes, milestones etc. This provides you with a bigger picture that helps you manage your sales and leads in a more efficient manner. Download a free trial version of InfoFlo today. You will instantly notice the difference in your productivity style. Satisfaction guaranteed.